Any student who has taken a class from me at the university knows how I feel about coloring books and other pre-drawn images for children. Some adults tell me it is 'relaxing' for children to just color. Coloring books are designed to occupy a child's time. For some adults that is a good thing. If you have ever taken young children on a long car trip or to the doctor with a long wait, coloring books may serve a purpose. If for no other reason than to spread out the time between, "Are we there yet?" questions. In school, however, color book-type pages are not appropriate, especially for young children. Teachers sometimes use those pages to keep a child busy so they can work with other children. Reading the research of Victor Lowenfeld, we find out that coloring book pages can take almost all creative thinking away from 50-60% of children. The other 40% may be effected as well, but may have been nourished enough to at least maintain some creativity. In fact, if a child continually uses pre-made pages, he may never be satisfied with anything that he draws. He will be upset that his drawings look like a child's drawings, not the adult drawings in coloring books. There are much better things to give children to occupy their time. Crayons and a blank sheet of paper are much more appropriate. Paints and watercolors are also effective to allow the child to create. One of my favorite activities is to give children construction paper and glue (scissors for 4+ children). I ask them to create a picture of themselves using just tearing/cutting the paper and the glue. This can be done with any theme or activity. Many adults would be shocked at the amazing projects that the children create. So, in my 30+ years working with children, I am even more convinced that coloring books can be the enemy. I want the children I have in my care to be thinkers and creaters, not colorers. I'm sure that many educators have done scratch art with a group of children. 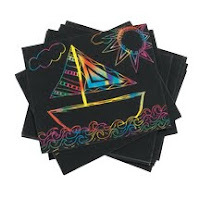 Whether you use commercially prepared scratch paper or create your own, it is a fun activity. The procedure usually involves children scratching the black covering off a piece of prepared paper. Hidden underneath the black are different colors that are revealed when the black is removed. I love to use this analogy with teachers about discovering the colors that lie underneath the surface of a child. Sometimes it takes a bit of work and creativity to discover those colors, but it is always worth the effort. As with scratch art paper, underneath the black there is a rainbow of colors. Those colors allow the artist to create an amazing picture as the colors pop out of the darkness. Many children come to our classrooms with a layer of dark. It is up to the educator to do more than just scratch the surface, but find the hidden colors and beauty beneath.